When you think of a “blended Scotch whisky,” what comes to mind? My first thought is a light, young, inoffensive, sometimes hot whisky that generally has mass appeal but is rough around the edges. Most blends are like this because they are cheap and sell really well. In fact, blends were practically the only thing available throughout much of the 20th century. Blends are still a huge part of the industry today because they can be produced and sold for much less than single malts. However, some blends are bucking the trend and trying to compete with single malts in terms of flavor and quality. Compass Box is at the forefront of that movement. Today I’m reviewing The General by Compass Box. It’s not often that a blended whisky is as highly touted as this release so it must be for good reason. 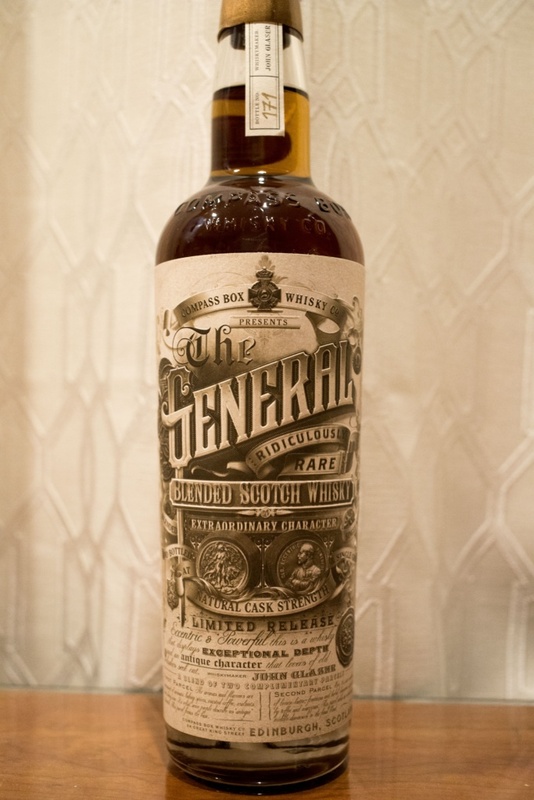 Unlike normal blends that are made up of a bunch of aged single malts and grain whisky, The General is comprised of two “parcels” of whiskies that were blended together, THEN aged. One of the two parcels was aged in ex-sherry for 33 years and the other was rumored to be aged in ex-bourbon for 40 years. Of course, officially stating that 40 year age would be a big no-no by the SWA so it’s just a rumor, guys *wink wink*. Blend these two blends together and you get The General. Can a super old blend stand toe to toe with some of the best single malts out there? Let’s find out! Nose Dark and musty like an old library. Leather, Raisins, spicy, malty, hint of fennel, other dried fruits, earthy undertones. With time, white pepper, overripe banana, eventually some red berries emerge. Taste Incredibly complex! My mind wasn't sure which note to pick out first. Wonderful oak, creamy, baking spices, dried fruits, Sherry, red wine, confectioners sugar, honey, minty. The spice and sweetness comes out a bit more with time but the oak is still there. Some citrus shows up after several minutes. Finish Long and slightly dry, leather couch, old wood, spicy, vanilla, dried cherries. More cinnamon and more wood over time. Overall Thoughts I know age is not indicative of quality but damn, this old stuff is really, really good. Old whisky can easily turn into an overoaked mess but this is definitely not the case here. Complex and challenging. Well done, Compass Box.